The centennial anniversary of the Foundation of the Pontifical Missionary Union (PUM) on October 31, 1916 gives us the opportunity to pause and reflect on the nature, mission and role of this Pontifical Institution and its service to the Universal Church in her missionary identity. Renewal, rethinking and reform are required if we desire to be faithful to the charismatic original insights of the founders, Pope Benedict XV and Blessed Paolo Manna, a missionary priest of the Pontifical Institute for Foreign Missions (PIME). Manna was born in Avellino on January 16, 1872 and died in Naples on September 15, 1952. Pope Francis, addressing the members of the Annual General Assembly of the four Pontifical Mission Societies (PMS) gathered in Rome (from May 30 to June 4, 2016), strongly reaffirmed the need for a real conversion and pastoral discernment for the sake of a radical reform of the PMS rooted upon the mystical passion and heartfelt ardor of saints and martyrs. Dealing exclusively with bureaucracy, administration and material aid reduces the PMS’s work to a mere administration of the existing reality and to a sterile repetition of the already known. By a provocative therapy (mystical passion and heartfelt ardor), Pope Francis puts forth a subtle warning that sterile administration and useless bureaucracy can wear out the true meaning of the PMS. “Let us be permanently in a state of mission”, is Pope Francis’ strong challenge for us in this centennial celebration. What we offer in the chapters of the new book MISSION MAKES THE CHURCH, marking this celebration, is our way to take into serious consideration the papal provocation. Each author tries to reflect upon this urgency so that the Vatican II renewal can be really effective for the Church through her missionary identity. The collection of these different approaches is deeply intertwined by a common understanding that mission unfolds the essence of the Church-World relationship inside God’s loving plan to save all. Being personally responsible for the contents of each chapter, each essayist gives his or her contribution with thought-provoking insights and cultural reflections for the mission of the Church. In chapter one, AGNES DE DREUZY describes the historical background within which Pope Benedict XV created the Missionary Union of the Clergy. During his short but decisive pontificate, Pope Benedict never ceased calling for acknowledgement of the church's transnationality and of a universal missionary spirit. Such a spirit would galvanize the Church to spread the Gospel worldwide and thus engender a spirit of unity with other Christians. Both Pope Benedict and Fr. Paolo Manna envisioned this renewed universal missionary spirit as “an essential condition for the total triumph of the gospel in the world.” Their common insight endowed the Missionary Union of the Clergy with the privilege of undertaking this momentous task. In chapter two, GIANNI COLZANI deals with the provocative affirmation that Mission makes the Church. His essay explores the theological foundation of the Church in her Mission and the pastoral implications for all churches of the precedence and priority of the Mission over the Church. Proclaiming the Gospel and dialogue with World Religions and Cultures represent the core of the Church’s Mission. The Church as such is made out of her missionary activity in the Spirit of the Risen Christ. Proclaiming the Gospel lays down the foundation for a Church who is always missionary in everything she loves, preaches, celebrates, does and hopes for. Missionary by nature, the Church always begins and ends by evangelizing herself. The Church is servant of the mission. Therefore, the mission is not the instrument, but the point of departure and the goal of all her pastoral and missionary endeavor. In chapter three, LEO D. LEFEBURE reflects on World Religions, Mission and Dialogue shaping the nature and activity of the Church. Vatican II with its ecclesiological renewal, its positive evaluation of Other Religions, and its openness to new interreligious and cultural challenges for the contemporary Church, initiated an ongoing missionary work that looks for deep conversion of the Church as such. Improved relations with the World, including Other Religions, offer to the Church a providential opportunity for a renewed mutual understanding and a growing communion toward common goals and eschatological fullness. In chapter four, AMBROGIO BONGIOVANNI highlights the significant role of education for the culture of dialogue. Dialogue represents one of the greatest changes of the Catholic Church in terms of language and approach expressed by the Vatican II and built on the active and living experience of faith of Christians and their communities (lay and religious) in the world, in the midst of people of different religions and creeds. The “culture of dialogue” needs to be nurtured by an appropriate and systematic education grounded on the existential, relational and hermeneutical approach for a better understanding of the “religiously other”. Here education is not a mere fact-finding process but a real transformative process. That requires a comprehensive vision of the reality where the paschal mystery, through the action of the Holy Spirit, assumes a universal meaning (Gaudium et Spes, 22). Finally, in the last chapter, FABRIZIO MERONI develops a theological reflection on the universality of God’s loving will that all should be saved. In light of Vatican II, the universal salvation of Jesus Christ shapes, from her foundations, the Church as Mission entrusted for the entire World. The entire Church is meant for the entire World, with no one excluded. This soteriological universality gives anthropological insights to better understand the Divine Missions, their Church and the world. The divine desire that all may be saved, the unity of all humankind in Jesus Christ and the universal sacramentality of his Church demonstrate how love, and only love, can be the way to eternal salvation for all. Both Christians, always in need of conversion, and the entire humanity, encounter in love and in the soteriological reality of divine mercy, the concrete availability of life and life in abundance. 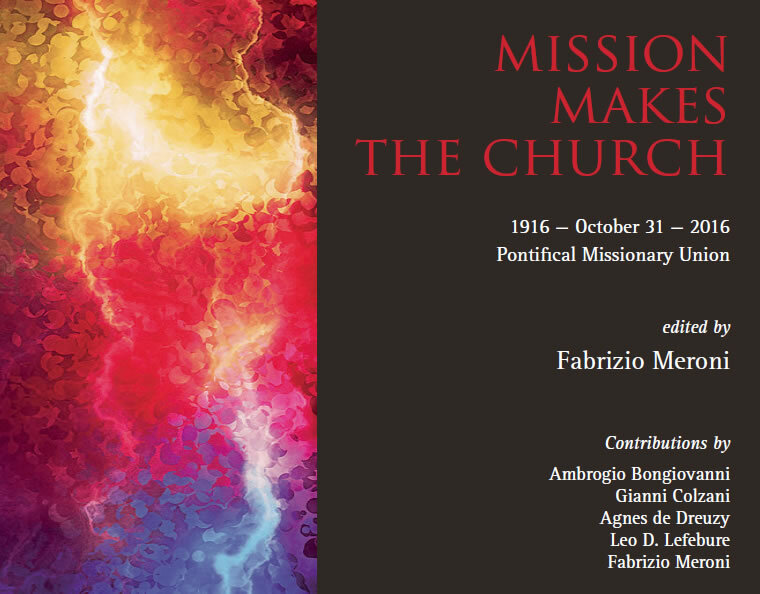 MISSION MAKES THE CHURCH, edited by Fabrizio Meroni, and published by Aracne Editirice, Missio Dei Missiological and Interreligious Studies, is available in libraries and on Aracne catalogue (www.aracneeditrice.it and info@aracneeditrice.it).